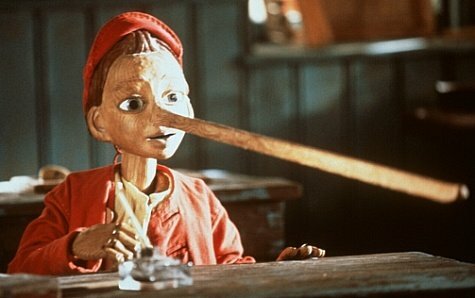 For all Pinocchio’s mate apologised for his antics in 2010, the latest ‘Voice’ suggests that Kingston residents can expect more of the same from the Lib Dems in this year’s local elections. This ‘local news ‘ was printed in Carlisle (which is in England – just!). Kingston is obviously short of printers. They boast of a freeze in the Council Tax – this year! The hope is that you won’t notice that last year they hiked it by just short of the amount which would have made them hold a referendum to pay for this year’s freeze. 2010 all over again. And they don’t tell you that they’ve had enormous help from Boris Johnson, who ended Ken Livingstone’s series of inflation-busting rises as long ago as 2009. Quite the tackiest bit in the whole thing is the supposed presentation of a ‘cheque’ to a Norbiton family for £1400. I do hope the family didn’t try to cash it! The credit for lower taxation is due to the Coalition government as a whole, including the 305 Conservative MPs, not just the 53 Lib Dems. On the local front we have a big picture of the Mayor surrounded by Lib Dem Councillors, including Surbiton’s Malcolm Self and Liz Green holding a ribbon to mark the ‘off’ for the wonderful Tolworth Greenway. Now I do wish they’d make their minds up about this. Only in December another Lib Dem Councillor, John Ayles, was suggesting to the assembled members of Ellerton and Bond Road RA that it was really the Tories’ fault that this thing had been put there as it was a Transport for London project under the control of Boris Johnson. So do they want credit for it or don’t they? Or is it just a case of “if you like it, we did it; if you don’t, it was the Tories!’?